A pioneering venue in Los Angeles electronic music scene, AVALON is thrilled to bring an unparalleled trance experience playing host to Sneijder, Transcendent, and Hghlnd for a legendary night. Featuring the genre heavyweight Sneijder, the event features a 4 hour euphoric set from the revolutionary tech trance pioneer. 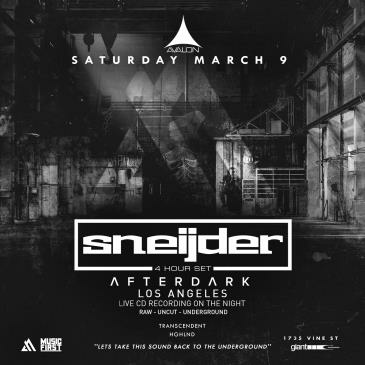 Launching label Afterdark, representing “all things dark, original and dance floor orientated”, Sneijder’s prolific position among the trance community brings his extensive discography to the evening. Alongside the renowned DJ, Hghlnd brings their crafted tracks ready for unparalleled energy on the dance floor. Redefining the meaning of dance music, the dynamic duo is known for their balance of club driven bass and elegant melodies. Transcendent will be warming up the night. As AVALON prides itself in bringing the best emerging acts in contemporary electronic music, the night is sure to feature a series of bass rinsed tracks and mind boggling tunes. Be sure to grab your tickets soon and prepare yourself for an evening with the most in demand acts in trance.